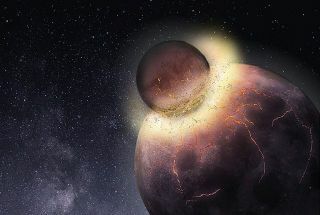 The long-ago giant impact that led to the formation of Earth's moon also helped make life as we know it possible on our planet, a new study suggests. "This study suggests that a rocky, Earth-like planet gets more chances to acquire life-essential elements if it forms and grows from giant impacts with planets that have sampled different building blocks, perhaps from different parts of a protoplanetary disk," co-author Rajdeep Dasgupta, a professor in the Department of Earth, Environmental and Planetary Sciences at Rice University in Houston, said in a statement. Carbon, nitrogen and sulfur are "volatile" elements, meaning they have a relatively low boiling point and can be tough for nascent planets and moons to hang onto. A number of other life-important chemicals, including water, are volatiles as well. "From the study of primitive meteorites, scientists have long known that Earth and other rocky planets in the inner solar system are volatile-depleted," Dasgupta said. "But the timing and mechanism of volatile delivery has been hotly debated. Ours is the first scenario that can explain the timing and delivery in a way that is consistent with all of the geochemical evidence." A schematic view of Earth's accretion that led to the origin of some of Earth's life-essential volatile elements, including carbon, nitrogen and sulfur. The team also ran computer simulations, exploring more than 1 billion different scenarios to better understand how Earth got its volatiles. "What we found is that all the evidence — isotopic signatures, the carbon-nitrogen ratio and the overall amounts of carbon, nitrogen and sulfur in the bulk silicate Earth — are consistent with a moon-forming impact involving a volatile-bearing, Mars-sized planet with a sulfur-rich core," Grewal said in the same statement. The results, which were published online Wednesday (Jan. 23) in the journal Science Advances, could have applications beyond our own planet, helping scientists gain a better general understanding of the conditions necessary for life to arise throughout the cosmos. "This removes some boundary conditions," Dasgupta said. "It shows that life-essential volatiles can arrive at the surface layers of a planet, even if they were produced on planetary bodies that underwent core formation under very different conditions."